Includes guided tour(s). See descriptions below for costs associated with special programs. Vesterheim staff may also be able to visit your classroom to give presentations. Please inquire for more information or to schedule your visit. Discover Immigrant America at Vesterheim Museum! Vesterheim is committed to providing fun and educational experiences for youth. 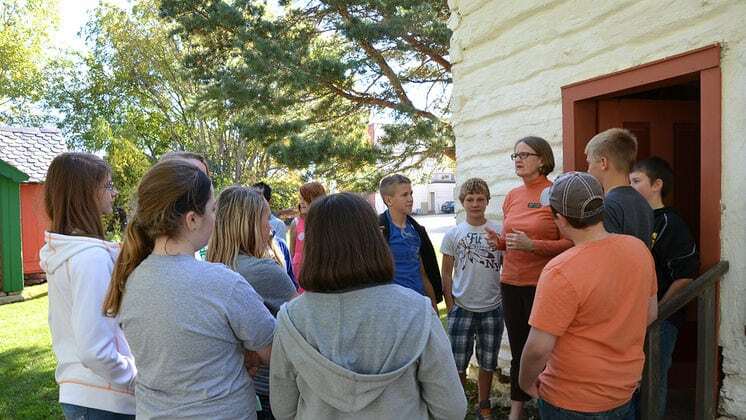 In addition to offering guided tours of the museum’s Main Building and historic buildings in the Heritage Park, we can provide special activities to enhance your curriculum or program. These special activities may be combined with regular guided tours. Cost: Free with museum admission. Reservations required. Journey from the Old World to the New and explore the history of immigrant America through the Norwegian-American experience. The Main Building is a visual delight, filled with objects from Norway and those that were made or used by Norwegian immigrants in the United States. 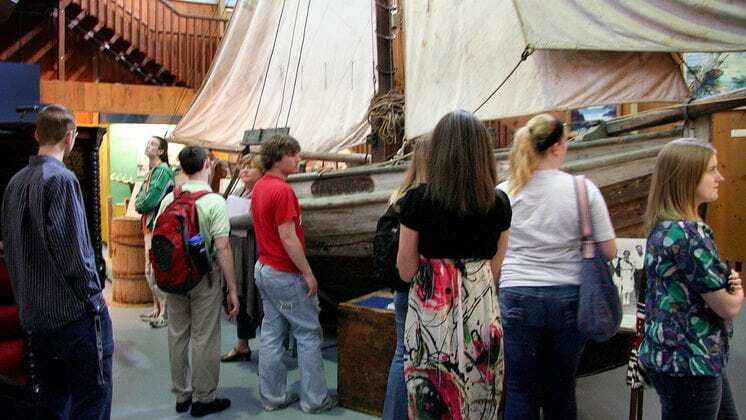 Students can step into an authentically furnished Norwegian house, listen to recorded dramatizations of immigrant experiences recounted in letters and diaries, climb into a recreated ship’s bunk outside of the famed sailboat The TradeWind, and learn about traditions through beautiful examples of historic and contemporary folk art, furnishings, and jewelry created in Norway and the U.S. Tours may be tailored to specific topics upon request. There are various historic buildings in the museum’s Heritage Park that are available to visit on guided tours. Arrangements may be made to visit just a few of the buildings, or to visit all of the buildings. Please note that these historic buildings are accessible by steps and are not climate-controlled. Check here to learn more about the buildings in the Heritage Park. Experience education from an earlier time. A schoolmaster will lead students through lessons in the museum’s one-room schoolhouse. Students will use slate boards, with chalk for writing and leather scraps for erasers, and can wear aprons or shirts that are reminiscent of clothing worn by children in the nineteenth and early twentieth centuries. Students will learn more about the history of this one-room schoolhouse, practice counting in Norwegian, sample sorghum sandwiches, and end the session playing nineteenth-century recess games (weather permitting). This program is available in fall, spring, and summer only. Please note that the school house is accessible by steps only and is not climate-controlled. What did immigrants bring with them to America in the nineteenth and early twentieth centuries? Why did they bring certain items and leave others behind? Students will visit Vesterheim’s Norwegian House, where they will answer these questions through guided exploration of an immigrant’s trunk. Students will touch and examine both real artifacts and authentic reproductions. Additional information about transportation and shipboard life will be shared. At the end of the session students will climb into a recreated ship’s bunk to experience travel and sleeping conditions. Immigrants and pioneers lived in all types of houses, but many early settlers lived in log homes. Students will build a small home using large, foam logs. They will be provided with a diagram, and will use problem-solving skills in a cooperative learning situation to build the home. Upon request, a discussion and display of tools used in log home construction may be included with this activity (please allow an additional 10 minutes). This activity may be paired with a tour of log homes in the Heritage Park, May to October. One chaperone (adult) is recommended per ten students. Chaperones are expected to stay with their groups and maintain appropriate behavior, including walking slowly up and down the stairs and not running in the exhibitions. All floors of the museum’s Main Building and Education Center are accessible by elevator and are climate-controlled. Buildings in the Heritage Park are accessible by steps and are not climate-controlled.